If you look over to the sidebar on the right, you will see a handy little doohickey that will let you to subscribe to our newsletter. In accordance with that, we are having a super duper Saga giveaway! From now until the end of August, every person who subscribes to our email newsletter will be entered into a contest to win Brian K Vaughn and Fiona Staples’ Saga Vol 1 and 2. Fresh off Eisner wins for Best New and Continuing Series, along with Best Writer, this book couldn’t have more buzz, and the first two trade paperbacks can be yours by just subscribing to our newsletter, which will deliver steaming hot podcast to your inbox every week! Double bonus! We will announce the winner in our inaugural Dragoncon episode! You can either type your address into the box on the right, or click this link right here! 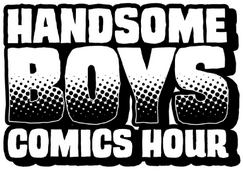 This entry was posted in Extras on July 22, 2013 by handsomeboyscomicshour. We drop this stupidity a lot. Just in case you were curious why we say this, here’s the source. This is “I Love You Man” starring Paul Rudd and Jason “Vanilla Fudge” Segel. This entry was posted in Extras and tagged references, totes mcgoats, What the hell's wrong with Eric and Robbie on June 7, 2013 by handsomeboyscomicshour.